I thought that I would preface the below article with a few words. First, this is not a typical astrology article for me or for this site as I usually go more in depth into the technical side of astrology. Second, I’m asking that you, the reader, take whatever you feel, especially the more non-beneficial type of feelings towards myself or the subject of Mercury Retrograde and write back, either below or through the contact page, instead of internalizing the anger and frustration that this topic or the opinion makers of this topic often cause. Thirdly, I’m not going to go over all of the basics of what real time transiting astrological Mercury Retrograde means, which is, by definition, what little about this topic almost all astrologers do agree on. To be fair, there are many strong beliefs about what Mercury Retrograde is and what it isn’t, in both the astrology and non-astrology worlds. And I’m not here to offend your beloved astrology teacher or you for that matter. I’m just offering my two cents and a few observations and a different view of Mercury Retrograde. Enjoy! Many regular folks these days (and consequently many more non-astrologers, psychics, intuitives, etc.) are jumping onto the Mercury Retrograde Bandwagon (abbreviated in this article as “MR”), which is a very regular, like clockwork, three time per year occurrence, lasting anywhere from 20 to 24 days and spanning anywhere from 9 to 16 degrees of retrograde travel each retrograde cycle. From the standpoint of Astrology gaining more and more credibility, this is actually a good thing because the effects of MR are fairly noticeable, even to the most narrow minded and dull of us; that is, of course, if these types will actually look at the dates and check up on the happenings during the various MR periods for personal verification, but I think that they should start with the undeniable Full Moon data first and then work their way up–just talk to any hospital nurse, police officer, social worker or firefighter. And the recognition of MR astrological phenomena as a whole seems to be more or less on a constant increase over the last five or six years or so. One of the key bits of advice and repeating recommendations to the public, every MR cycle about MR phenomena, spanning the gamut from pseudo-spiritual pundits to mainstream media experts is to simply refrain from starting or doing almost everything while Mercury is retrograde. I think that this is terrible advice and will urge you here to simply ignore it, especially if it causes you any kind of fear or trepidation whatsoever. And for those sad many that do worry and will succumb to the fear and bad MR advice, the only thing that I can do is lower my head because now we’ve unfortunately created new potential MR quasi-victims–as if the Full Moon and eclipses weren’t enough. (With MR as the perpetrator–he, he, he…just kidding). And I don’t think that that’s such a productive way to deal with the energy of MR. And yes, in some rare cases the MR trickster energy can seem to operate in a most vicious way—as an astrologer, I’ll give you that as there are those few cases where MR aspects certain sensitive points in the various charts of one person (yes, we all have charts–plural) resulting in temporary havoc in the life of the individual. In my humble opinion, the best way to approach MR is with education and information and to realize that there’s a learning curve to all of this MR astrology stuff as well. And to realize the truth that the real and perceived effects of MR astrological phenomena are and have been a raging debate amongst astrologers for thousands of years and there’s still no clear cut answer in sight, just more confusion from the various arguments that both astrologers and non-astrologers have with themselves, which is in and of itself a very MR kind of thing to do anyway…(that is, argue for thousands of years). My own personal encounters with MR will fail to prepare the reader for the rest of their life with MR and the same goes for the readers own advice to anyone else about MR. Mercury Retrograde is a mystery and a challenge and an adventure all rolled into one. Let’s back up a bit and look at things in a different way for a moment and discuss a few fundamentals. Let’s move along to the reality of the disruptions that MR often accompanies. People report computer issues, electronic malfunctions, car troubles, outbursts from co-workers and miscommunications of all kinds. You know what? The stories are all true. In fact it’s perfectly wonderful that your computer burned up because you were probably going to be hacked in a few hours anyway. It’s great that you had that flat tire because that gave someone else–a perfect stranger–an opportunity to reach out and lend a hand. It’s fantastic that the mule that has been loaded up with tremendous amounts of work for years and years and never once complained and who was never fully appreciated finally decided to run off and leave your company high and dry, costing you many thousands of dollars (Now you’ll have to RE-train someone else). That took a much needed and required load off of that person AND allowed someone else to learn something new. It challenged someone and they became more whole because of a different opportunity that presented itself. And the workaholic got to start a new life somewhere else. The most problematic retrograde Mercury periods occur when the speed of Mercury is the slowest while retrogressing. 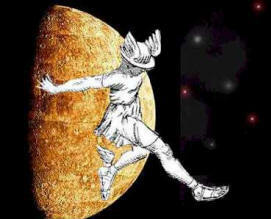 This happens when Mercury is retrograde for 24 days, but is only reversing 9° to 10° in the Zodiac during that period. The least problematic retrograde Mercury periods occur when the speed of Mercury is the fastest while retrogressing. This happens when Mercury is retrograde for 20 days, but is reversing 16° in the Zodiac during that period. These can be called “Shorties” (20 days = fast and not so bad) or “Longies” (24 days = slow and awful). The third category is called a “Middie” (22 or 23 days with 12° to 14° of travel while retrogressing), and these retrograde periods can go either way. Moving along into the not so distant future this summer of 2018, and seeing what is particularly wonderful and troublesome (again, with one’s perspective in mind) is that one of these Middie MR cycles falls right smack dab into the middle of a more rare triple eclipse season this summer, two solar and one lunar, with MR stationing retrograde just a day and a half prior to a total lunar eclipse on July 26th and 27th, 2018 respectively. And this truly is a more rare eclipse pattern, according to my preliminary research, which includes a partial solar eclipse, followed by a MR retrograde station (MR start), followed by the aforementioned total lunar eclipse, which is then followed by another partial solar eclipse, and finally followed by Mercury stationing direct (MR stop)–and that’s just part of the story. (All eclipses are two weeks apart from each other, by the way, just like new and full moons). The most recent patterns for this particular kind of eclipse “one, two, three punch” of the solar, lunar, solar, if you will, occurred in the summer of 2011, 2000 and 1982. I’m not sure about MR affecting these previous or far future eclipse cycles yet, as I haven’t gone that far in the research. Ok, back to MR, I’m getting off track…but isn’t that the point? This is an article about MR and hopefully about a more complete comprehension of the topic, instead taking you too far off the beaten path. Wait–that’s what MR is all about, isn’t it? Moving along again. In short, the truth of Mercury retrograde is so much more nuanced and complicated and wonderful than almost anyone of us can imagine, as Mercury helps us to write our own highly unique story and let us dream again and stumble onto those accidental discoveries and capture and appreciate those treasured moments with the full impact they deserve. We can meet new and wonderful people and make friends. To clarify, we’ve focused too much on the inconvenient “disruptions” especially involving computers and electronics, travel plans and wedding arrangements, etc. I think that the better “general advice” from the popular “echo chamber” that is YouTube and the Web and mainstream news outlets would be to simply forget about MR and live your life as you normally do–you’d be better off without all of the additional fear promoted by the “Ex-Spurts.” (Again, and I want to stress “general advice” and this does not necessarily include advice for the more thinking and reasoning types that have made it all the way to the end of this article…). Special thanks to Elizabeth, Christopher and Skeeter for the inspiration for this article!